All of this has made a tangible impact on people living with cancer in North Wales. The campaign will culminate this June 2017 with a walk across North Wales led by Mike and his wife Jules, who have both received a cancer diagnosis. Through the By Your Side Walk Mike and Jules aim to: encourage others to give thanks to the fantastic NHS staff who continue to provide treatment and care for them here in North Wales; inspire people to keep active and enjoy this amazing part of the world; celebrate all that we in North Wales have and remember the people who are no longer with us. The walk will focus on raising awareness of a different type of cancer every day. The walk and associated initiatives and celebrations provide opportunities for: children and young people to absorb important public health messages whilst participating in fun group activities; school groups and local music groups to take part in community musical events; businesses, families and other groups to join in with fundraising activities. It provides people of all ages and all abilities in North Wales to get involved in a distinctive community project which has the potential to create a significant and lasting legacy. The walk is over 130 miles in total. *Open to all that want to take part. Detours and stops will be made at important milestones including hospitals and medical centres, schools, supporting businesses and community centres. If you have a group of 3 or more people and want to get sponsored for taking part in one of the days which are not open to all, please contact Hannah or Kirsty in the Awyr Las Fundraising Support Team who can arrange for your group to take part on those extra days. If you want to take part but wish to raise money for a different fund within Awyr Las, please go ahead! The aim of the By Your Side campaign to make healthcare in North Wales the best it can be and the plan is to stage an event that many people will be able to benefit from. On Wednesday 14th there will be a Black Tie dinner at the Faenol Fawr with music and entertainment. This is a ticketed event, £50 per person or £450 for a table for 10. Details here. On Thursday 15th the walk will start with music in Flint Castle. There will be music and in Broughton at the end of the walk that day. Details here. On Friday 16th the walk will start with music at Wrexham Maelor Hospital and finish at Wrexham Football Club. Details here. On Saturday 17th there will be music at the start and much more music at the end in the fantastic Ponderosa Cafe! On Sunday 18th the exact start location near Ruthin on Offa’s Dyke Path TBC. Exact finish location in Prestatyn TBC. Details here. On Monday 19th the Walk will start at the hospital with music. Finishing details are being confirmed. Details here. On Tuesday 20th the start will be at the school. We’re organising a fun finish at Bryn Williams. Later in the evening there will be a 5 course meal hosted by Bryn; this will be a ticketed event, £100 per ticket. Details here. On Wednesday 21st there’ll be a school start with music and a town centre finish. Details here. On Thursday 22nd there’ll be a school start with music and a fun finish at Treborth with family activities and a Bed Race finishing in Menai Bridge with a BBQ and music. Details of the Bed Race here. Up to 18 teams of 8-10 people can enter, £50 registration per team. There will be no registration fee for NHS staff teams and students. On Friday 23rd there will be a BBC Wales Radio broadcast from Ysbyty Gwynedd and the newly refurbished Alaw Cancer Unit in the hospital will be officially opened. The start of the Walk will follow the official opening and there’ll be live music in Caernarfon Castle at the finish. On Saturday 24th there’ll be live music at the start of the walk in Electric Mountain, Llanberis. There’ll be more music up Snowdon and at the summit. In the evening there will be a large gig at The Heights, Llanberis, with headline acts to be confirmed. The gig is a ticketed event. Details here. Free for children under 12 years.On Sunday 25th there will be a festival day in The Heights in Llanberis from 3pm with live music from local and emerging talent, food and family friendly activities. 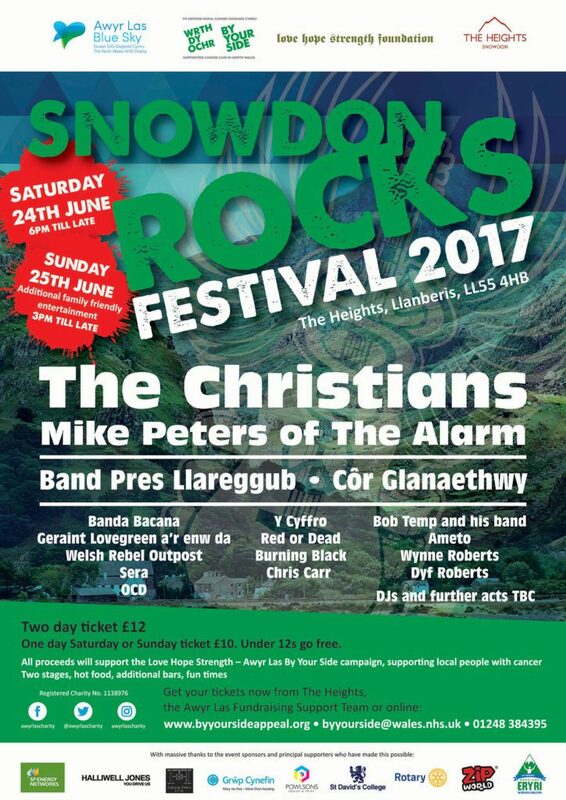 This is a ticketed event, £12 for a two day Snowdon Rocks Festival ticket (including the gig on the Saturday). Free for children under 12 years. Snowdon Rocks Registration Fee: £20 per day for those aged 12 and over / under 12s free. The full registration fee will support people with cancer and their families. If you are participating in other sections of the By Your Side Walk, these must be booked separately. All walkers are asked to raise as much money as possible. All walkers will be given a complementary ‘By Your Side’ campaign snood. Walkers who raise over £500 will be given a special edition ‘By Your Side’ t-shirt. Those that raise over £1,000 will be given a complementary ‘By Your Side’ campaign jacket. Please note that if you plan to raise over £150 in sponsorship through Snowdon Rocks then we’d like to offer you a complementary ticket for the two day By Your Side Festival. Please contact byyourside@wales.nhs.uk and we will put you on the guest list. 23/06/2017 Midday – 4:00pm Electric Mountain Visitor Centre http://www.electricmountain.co.uk Walkers registration for those who want to register early! 24/06/2017 11:00 am Electric Mountain Visitor Centre The hike begins! More live music on the way at Pen-Y-Ceunant http://www.snowdoncafe.com, the Halfway House and on the summit of the mountain. 24/06/2017 3:00 pm Summit Strength train arrives for a 30 minute stop at the summit. Registration for this and the Rainbow Train open from April. Rainbow train arrives at 3:30. Passengers are able to meet walkers on the summit platform or at the summit gig. 24/06/2017 3:00 pm Pen -y – Caeunant First walkers return to enjoy complementary soup and share a drink with friends. Others may not arrive back for a few hours! 24/06/2017 6:00pm The Heights Snowdon Rocks Festival at the Heights begins. Please fill in all walker names, including children, and emergency contact numbers on the online registration form. Sunday 25th June, 3pm till late. Guest appearances, special sets from local and emerging talent and additional family friendly entertainment. Two day ticket £7 before 1st May, £12 after this date. One day Saturday or Sunday ticket £5 before 1st May, £10 after this date. Saturday 24th June, 6pm till late: Mike Peters of The Alarm, The Christians plus special guests and DJs. Thanks to our fantastic event sponsors, all costs of the Festival are covered, ensuring that all the monies raised through the Festival will go directly to helping people with cancer and their families in North Wales.